The United States Pro Kart Series opened up their 2016 schedule this past weekend at the New Castle Motorsports Park. 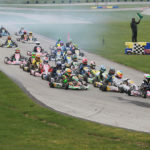 It was the fourth straight year that the series has visited the facility, but the first time in the four-year history that it did not open the season at the GoPro Motorplex – that event is set for July this year. The program had been dormant for nearly nine months since the series was trackside in 2015, ending a long extended break as the four-event championship is now underway. The weather was certainly the coldest it has been during the month of May in a long time. Friday was comfortable until a cold front moved in overnight and high winds kept everyone layered up throughout Saturday. Sunday brought on the sun, but the heavy winds stayed to keep spectators bundled up. Numbers were a bit lower than the previous opener at GoPro in April 2015, down about 20 entries, which equates only to roughly 10-15 drivers. In my Paddock Pass on Friday, I mentioned that it may be because of the busy winter months and the later start. The new WKA Winter Cup program was introduced, and kept the shops busy, which is a great thing. On the flip side, it can put some pressure on the racers’ budgets because as much as we’d like to think there is not, there is a limit to the amount they can spend to go racing. A few former series regulars were not in attendance, bringing up that particular line of reasoning. It could be because of the Winter Cup, or because the Manufacturers Cup schedule suits them better. Or it could just be the month of May didn’t work and Shawano will be even bigger. Obviously, with those people not there, it’s hard to understand. No matter, the event was a success. My purpose for mentioning this is looking ahead to the months of July and August. USPKS, WKA and SKUSA all host events in July in a three-week time period. Not every racer will and can compete at all three events, and it could mean one event suffers, or nothing changes. My hope, is that all three have successful events, but I’m looking at it with a ‘half-empty’ type outlook. I have the distinct advantage of sitting up in the tower at all the events I go to, and have the ability to listen in on the radio chatter throughout the weekend. 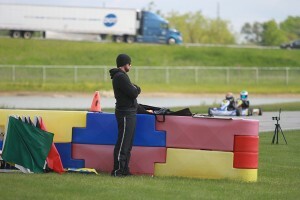 A new on-track crew is overseeing the action at the USPKS, led by new race director Jason Ludwig. He, along with assistant race directors Kevin Harris and Cale Wyse, in addition to former series racer Tony Jump as head flagman and Steve Everitt as grid marshall, are the eyes on the track for 2016. It was a successful weekend watching them work, and with the help of the racers not going too crazy with their actions, it was a safe and clean weekend that saw only one red flag for a single kart roll over and no one injured. The real test will be the tricky Shawano facility next month, spreading the crew out across the long and rolling circuit. What makes them different from the previous crew, and ones we typically see around the country, is their age. Two of the officials are just over the Masters age and the other two are closing in on 30-years-old. This is something we really need across the board in United States karting. For years, karting was built around the foundation of volunteers and those willing to bend over backwards to help promote karting events. We need former and current racers to step up and help guide today’s racers down the correct path in terms of on-track behavior, and the best way to do it is working on-track. The term ‘volunteer’ is gone at the national level, and now nearly every position is paid help. If you are getting paid, it is expected that you perform your job well, and the race director is among those high profile positions that all the competitors see and hear throughout the weekend. Two incidents put them to the test on the weekend. 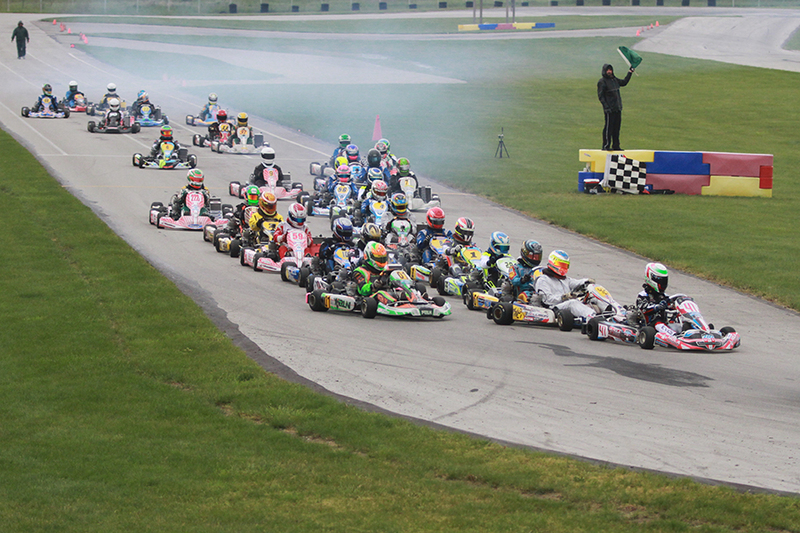 Kaden Wharff and Luca Mars were involved in an on-track incident on the opening lap of the IAME Cadet main event. Wharff was penalized for pushing Mars off the track in the middle of the straight between turns four and five. A video of the incident was published on Youtube for a short time on Saturday before being pulled off the internet by the creator, and it was shown to officials after the event. USPKS officials had already penalized Wharff for the contact during the race, and afterwards had discussions with the young driver and his parents regarding the incident. Before moving on, I’d like to remind our readers, this is about kids who are 12 years-of-age and under. As a parent, each and every moment is a teaching moment. Some are good, some are bad. There is no correct or proper way to raise children – just as long as the kids understand the difference between right and wrong. Sunday during the Yamaha Cadet main event, Wharff was fighting brothers Garrett and Logan Adams for the win. Coming down to the checkered flag, both Wharff and Garrett went for the same piece of the track, making contact. Wharff carried his momentum to cross the line first, but was penalized for the contact. Officials reviewed GoPro footage – now allowed per series rules (Page 7) in a protest situation – and reversed their call. As the year goes along, it will be interesting to see how GoPro footage dictates other calls. On the other side of the fence is the technical inspection. Rick Jump and Tim Andersen are continuing to increase the amount of testing in the tech barn. Among the newest is a fuel tester, helping to keep racers on the same spec fuel and oil. Bringing back an old procedure, they conducted clutch tests on the IAME Swift engines prior to the qualifying sessions. At the end of the weekend, Jump took the right-rear tire from the top-five of the IAME Pro division, to have them tested for any additives not related to the construction of the tire. More on that following the test procedure. With all the specs laid down for competitors, tech inspection becomes more intense and the USPKS program is making sure to stay on top of things. Just two drivers were at the top of the time sheets throughout Saturday and Sunday in IAME Pro, featuring 21 of top-50 in the eKartingNews.com TaG Driver Rankings. The duo included last year’s double Junior champion Brandon Lemke and second-season Senior Braden Eves. In qualifying, the heat races, and the main events, it was either the Franklin Motorsports / Merlin of Lemke or the Motorsports Driver Development / Kosmic of Eves out front. Lemke looked to have Saturday’s main in control, until Eves ran him down and drove to the victory. Sunday was the opposite as Eves had the field covered until Lemke came through to score the win. It was the first series victory in the IAME Pro category for both, taking home $1,000 a piece. Each now leads one of the major championships in the country. 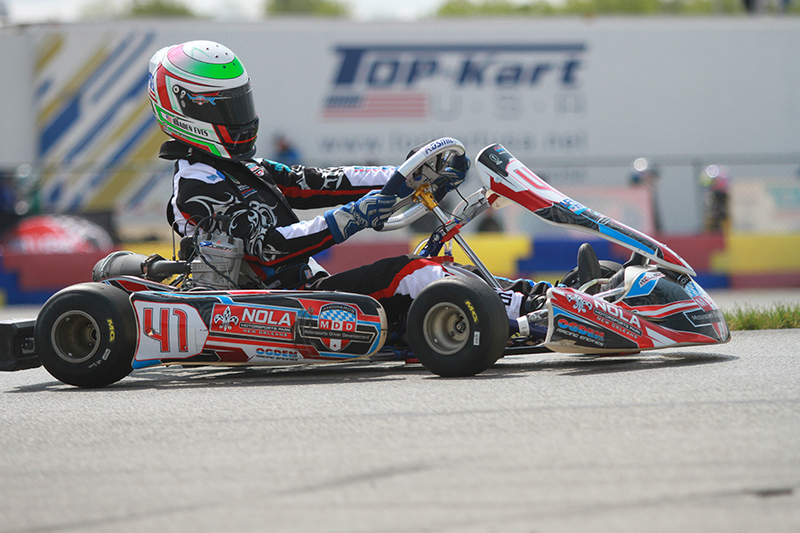 Eves has the advantage following his big win at the SpringNationals in the SKUSA Pro Tour championships, while Lemke holds the slight point lead following the first USPKS weekend. Lemke has been climbing the karting ladder since he became a Cadet champion just a few years ago. Brandon works alongside his entire family, including his father Bill as the wrench, and driver coach Jason Birdsell. Lemke is the latest to come up through the Franklin ranks, all on the same Merlin chassis, following in the footsteps of Trent Hindman, Shawn Sharkey, and Kyle Kalish. For Eves, it has been a year of building confidence. Last July, Braden moved up to the Senior division after starting the first two events in the Junior category at the USPKS. He, too, works alongside his father, Greyson, as mechanic, with IndyCar driver Jay Howard helping to guide Eves over the last few months. Talking with them in New Castle, the increase in confidence has helped Braden go from a driver who can throw down a few good laps, to being able to compete at the front of the field in the Senior division. Why is Yamaha Racing Not at Every Track in the Country? Each and every race weekend with Yamaha competition, I am always left asking ‘Why is this category not huge across the country?’ The Yamaha Pro division at the USPKS never disappoints, along with the younger classes. The two Pro main events left us all wanting more, as each of the 17-lap races were a game of chess, leading up to a last lap battle for the checkered flag. 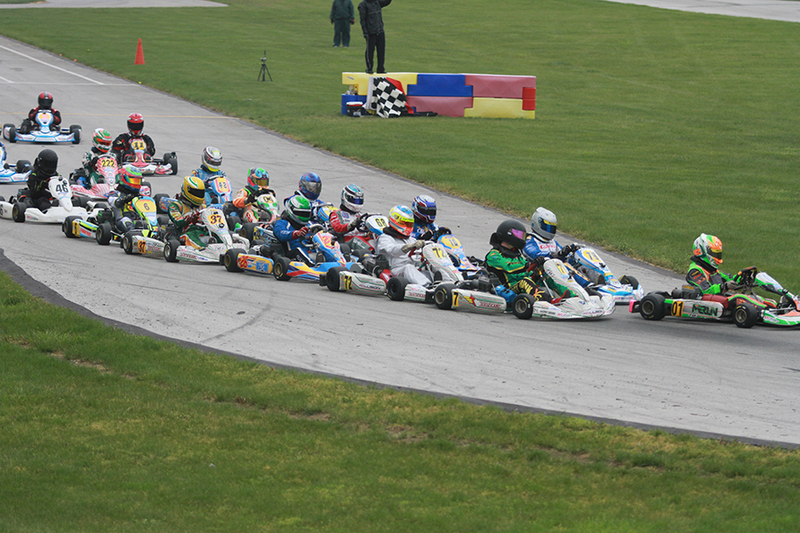 Three drivers were in contention on Saturday, including track regular Jimmy Simpson, who borrowed a Tony Kart from Olivia Horn after the 2009 Biesse he pulled out of the NCMP garage was not permitted to race for lacking a CIK-style rear bumper. Dakota Pesek and Brandon Lemke were the two championship contenders in the hunt. The trio went jostling for position on the final circuit with Top Kart USA’s Pesek getting the best run out of the I-70 corner to beat them to the checkered flag. On Sunday, Simpson and Pesek were joined by Senior rookie Zach Holden as the Koene USA / Tony Kart driver was among the quickest all day. Holden latched himself on the bumper of Pesek for much of the race until the final lap with Simpson in tow. Simpson was the mover, attempting to go from third to first in one corner. They came out of the final corner three wide, and at the stripe Simpson got enough of a draft to reach the line first by just 27 thousandths. Races like that, and piloting a Yamaha machine, teaches pilots key components to being a great driver. Much like we saw in the early days of SKUSA, where the 80cc helped to groom the future stars of shifterkart racing, I believe Yamaha can do the same for TaG drivers. Patience, racecraft, and how to be smooth with the wheel. In a 17-lap event, you know staying with the leader or maintaining the lead is vital to your chance at the podium. The Yamaha engines are very similar, making decisive passing maneuvers key to moving up through the field. The low horsepower teaches a driver to make as few of mistakes as possible. Each error adds up throughout a lap or throughout the race, making it unlikely that you will stay within the lead pack. Engine builders across the eastern half of the United States continue to support the engine package, along with race tracks and clubs. Elsewhere, there is no local support for Yamaha racing. It is the 2-Cycle counter-part to the Briggs LO206 category, with a little bit more in terms of pocket-book expense, and a little bit more for maintenance. Looking at the younger categories, the engines are nearly bullet-proof and provide a great step up from 4-Cycle racing or a slower option to the TaG engine package for 8 to 12-year-olds. 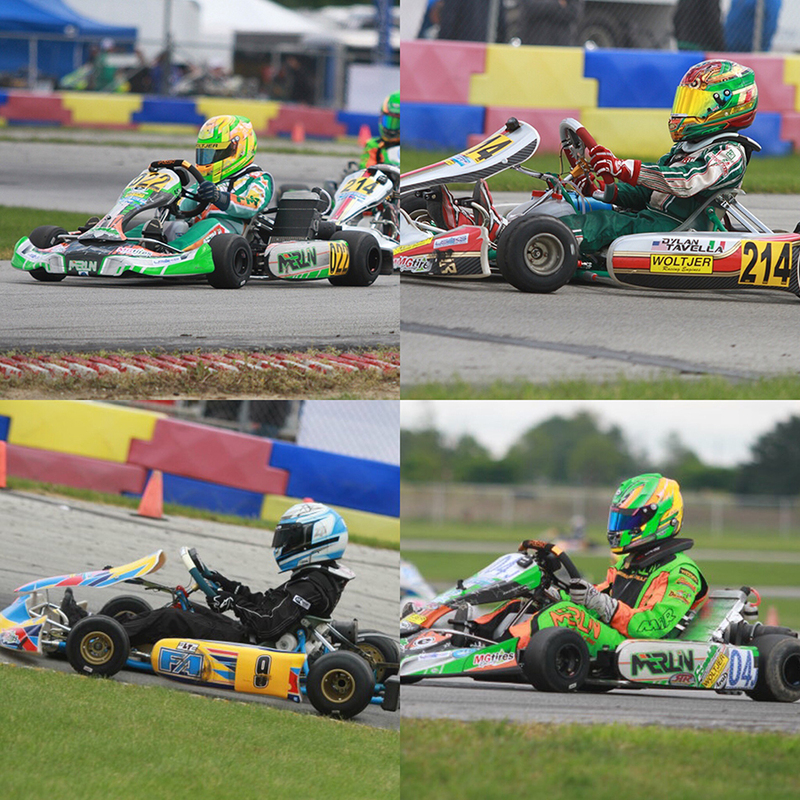 Four different racers took to the top step of the USPKS podium in the Junior categories. Franklin Motorsports / Merlin teammates Alex Bertagnoli and Sam Mayer conquered the IAME division, while Zack Pretorius and Dylan Tavella came out on top in the Yamaha main events. This comes after a dominating year by Brandon Lemke, who won 13 of the 16 Finals in 2015. Three of these drivers were among the top Cadet drivers just a few years ago. Tavella (Iron Rock Motorsports / Tony Kart) was a double Cadet champion in 2014, while Mayer won a title in 2013. Bertagnoli and Tavella are in their second seasons in the Junior ranks, while Mayer is starting strong in his rookie campaign. Pretorius (Comet Kart Sales / FA Kart) is new to the USPKS, making his series debut after earning KRA championships last year at New Castle. Zack is gearing to make a run in the Yamaha title chase, and will be tested with the US Air Motorsports Raceway in Shawano next month. The Junior division is wide open with Fenderson, Schaff, Gibbs and Dial all shut out of the win column on the weekend. Next on the calendar is a return trip to the US Air Motorsports Raceway in Shawano, Wisconsin on June 17-19. The ‘roller coaster’ circuit was sold last summer, and remains operational with the USPKS making a second straight trip after recording over 170 entries per day. There will be no better way of spending Father’s Day weekend then at the racetrack – and you can catch it all through our EKN Trackside Live coverage.